Papers allows you to customize your reading experience in a number of ways. In this tutorial we will discuss the type of options available to you in Papers Options. In this section you can select how you would like Papers to handle your documents. Checking "Remember last read page" can be particularly handy if you are reading long papers in stages. Papers will remember where you last left off when you were reading any document, and will bring your right back to the page where you stopped reading. Leaving this box unchecked will always open your documents on the first page regardless of where you left off last time you opened it. In another application. 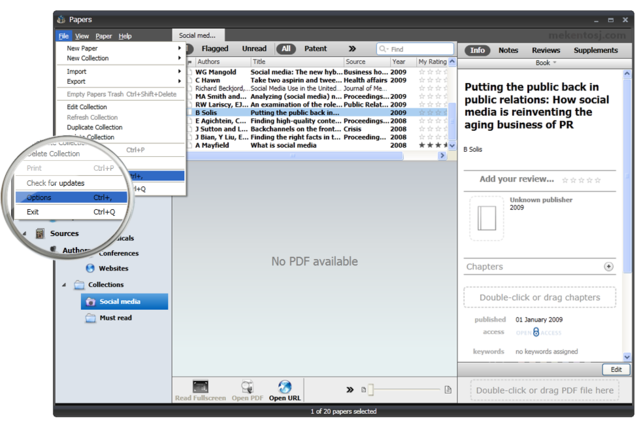 You can choose to open your PDF files in another application if you wish to read it outside of Papers. If you select this option, you can choose any program on your computer capable of reading PDFs. Congratulations! You've now personalized your Papers reading experience.